Where do fast food characters go when they get cut from commercials? Jenny Craig, Slim Fast or mental health facilities? The Fat Food Police (FFP) are making yet another childhood staple less fun. This time good 'ole Ronald McDonald is in their sites. 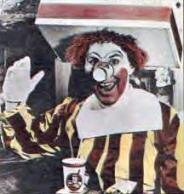 Bloomberg news is reporting that MacDonald's is going to be putting the red haired clown away-- at least away from the fry-o-later (they don't want another MJ incident.) Instead of being the burger and fry pushing clown of my youth, he shifting his focus. The 50 year old spokesman is now just an ambassador. That means he'll probably be doing goo things like helping raise money for worthy causes (like Angelina Jolie.) Yes, there is an obesity epidemic but do we really think its the fast food characters or parents to blame for overweight children? Anyway, I think Ronald was getting lonely in his old age anyway. He'll have more time to spend with the Fry Burglar, the Fry Kids, McNugguets, Birdy and Grimace. As it turns out they were first to go. I wonder what they've been doing.-- Golf? Peace Corps? McDonalds says it'll be focusing more on its coffee and salad selection. So you can forget the Happy Meals too.- bummer. They feel like Ronald represents the old McDonald's not the new hip McDonald's. Sounds like a SpongeBob Episode. BTW wasn't this guy the first Ronald McDonald? How could you cut him?